For those Christmas decorations you ought to be proud of. Balls: six 3"; two 2-1/2"; seven 2"; (12) 1-1/2"; (12) 1"; (11) 1/2"
Wax knife blade with old candle. Cut wreath ring in half, forming swag. Slice 1/2" off two 3" balls. Glue cut edges of balls to ends of swag. Break in half 11 toothpicks. Insert and glue one-half toothpick in three 3", two 2-1/2", five 2", nine 1-1/2", and two 1" balls. Arrange balls on front of swag and then glue in place, gluing largest balls first. Refer to photo for placement. Build three snowmen from 1-1/2", 2" and 3" balls. Cut small slice from top and bottom of 2" balls and one end of 1-1/2" and 3" balls; glue cut sides together. Paint six toothpicks brown; let dry. Insert toothpicks in center ball for arms. For scarves, tie 8" length of 1/2" wide gold ribbon around necks. Glue on eyes. Paint small rose-colored mouth. Lightly blush cheeks. Thread 1/8" ribbon in darning needle; thread 1" and 1/2" balls on ribbon, following photo. Vary sizes of balls and ribbon lengths. To add ribbon tails to snowmen, insert and glue ribbon directly into bottom ball. 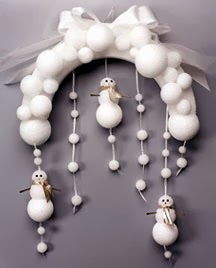 To add ribbon hangers to snowmen, insert and glue ribbon directly into top ball. To hang ribbons from swag, insert and glue ribbons directly into wreath. Tie small knots at ends of ribbons. Brush thin layer of gel glue on tops of balls and on snowmen. Lightly sprinkle glitter on glue. Layer together 3" satin ribbon and 5-1/2" tulle ribbon; tie large bow; trim ends to point. Glue totop of swag. For hanger, tie loop in 6" length of 1/8" ribbon; insert and glue knot in back of swag.